Veeam Availability Console – What’s in it for Service Providers - VIRTUALIZATION IS LIFE! Today, the Veeam Availability Console was made GA meaning that after a long wait our new multi-tenant service provider management and reporting platform is available for download. VAC is an significant evolution of the Managed Backup Portal that was released in 2016 and acts as a central portal for Veeam Cloud and Service Providers to remotely manage and monitor customer instances of Backup & Replication including the ability to monitor Cloud Connect Backup and Replication jobs and failover plans. It also is the central mechanism to deploy and manage (Windows) agents which includes the ability to install agents onto on-premises machines and apply policies to those agents once deployed. Veeam® Availability Console is a cloud-enabled platform built specifically for Veeam Cloud & Service Provider (VCSP) partners and resellers looking to launch a managed services business. Through its ability to remotely provision, manage and monitor virtual, physical and cloud-based Veeam environments without any special connectivity requirements, Veeam Availability Console enables you to increase revenue and add value to all your customers. The Cloud Connect Gateway is central to how the Veeam Availability Console operates and all management traffic is tunneled through the Cloud Connect Gateways. 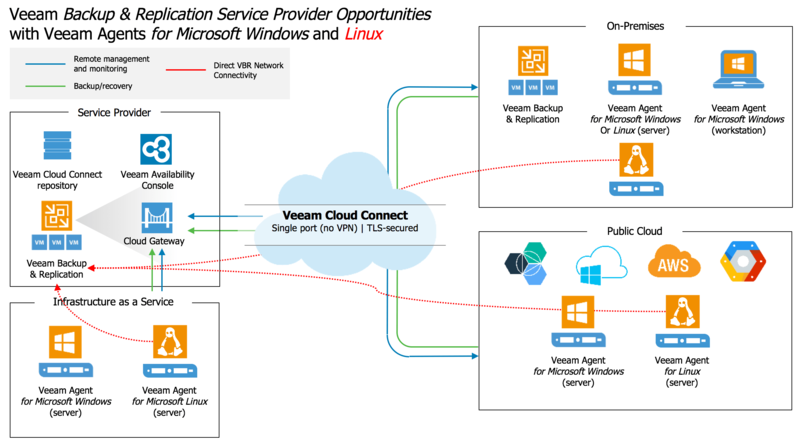 If you are a current VCSP offering Cloud Connect services then you already have the infrastructure in place to facilitate VAC, however if you are not a Cloud Connect partner you can apply for a special key that will enable you to deploy a Gateway without the need for specific Cloud Connect backup or Replication licenses. For a deeper look at VAC architecture for Service Providers, head to Luca Dell’Oca’s VAC series here. The Veeam Availability Console was designed from the ground up for Service Providers (there is an Enterprise version available) and contains a rich set of APIs that can be consumed for automation and provisioning purposes. There is also a three tier multi-tenancy design allowing VCSPs the ability to create restricted accounts for their partners or resellers from which in turn, another level of accounts can be created for their customers or tenants. The multi-tenancy aspect means that partners/resellers and customers can control their own backups centrally from the console. Reporting on backup jobs can be viewed and a mechanism to control those jobs is available allowing retry/stop/start tasks against those jobs. If that’s not enough control or more troubleshooting on failed jobs needs to be done the Remote Console feature introduced in Veeam Backup & Replication Update 2 has been integrated into the console. VAC also includes built in reporting and billing functionality which enables VCSPs who don’t have the capability for automated reporting and billing to offer that to their customers. The reporting can be accessed via the API meaning that if an existing billing engine is being used there is the possibility to have that interface with VAC to pull out key data points. Over the past year I’ve talked a lot about the opportunity that exists for Veeam’s Cloud and Service Providers to take advantage of the opportunity that exists with Veeam’s Agents to capture backups for workloads that previously were out of reach. VAC is central to this and opens up the ability to backup instances that live on-premises (physical or virtual) or in any public cloud hyper-scaler or otherwise. 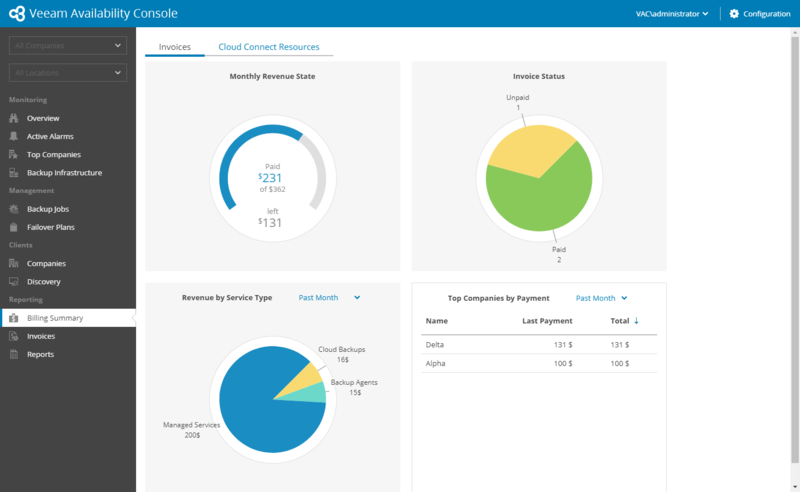 If you are a reseller looking to cash in on the growing data availability market then you should be looking at how VAC can help you get started by leveraging the features mentioned above . Secondly, if you a reseller and not running Cloud Connect Backup or Replication then the time is right to start looking at getting Cloud Connect deployed and start generating revenue around backup and replication services. For those existing VCSPs that are offering Cloud Connect services, adding VAC into the mix will allow you to take advantage of the agent opportunity that exists as shown above while also adding value to your existing Managed Backup and Cloud Connect services.